Randy Grubb was supposed to be a dentist. 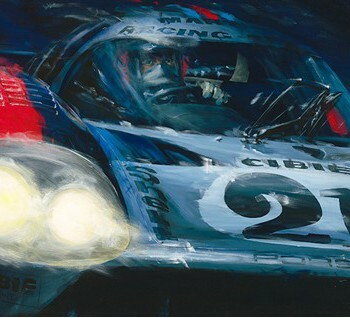 So how did he end up being an Automotive Artist? Part 1 of his two part interview. I know your name, first and foremost, because of the tankcar you made for Jay Leno a while back. But a few of the other artists that I’ve interviewed have mentioned your work with great admiration. Do you know Baron Margo and Ferdinand Metz? It’s a mutual admiration society! Some of Baron’s art is hanging in my home. I collect small sculptures and pieces of art. You are the second designer I’ve spoken with. Do you consider yourself a designer or an automotive artist or something else entirely? I’m an automotive artist. I draw a distinction between what I call a contraption and a full function sculpture that you can drive. 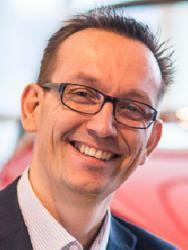 A lot of the motors that I start with are very unusual – for instance the 1800 cubic metre engine in Jay’s car. It’s just a challenge to work with something that large. Most people would be happy hooking wheels up to it and making something you can drive. That’s not my goal. I’m trying to create balance within a sculpture. Because of the scale of most of my pieces, these motors won’t fit in any existing cars. I start by designing the rest of the car around the motor. It’s a scaling project; everything must be proportional. I was born and raised in Glendale, Southern California. Glendale is kind of a funny spot. Frank Kurtis who brought all the Indianapolis cars in the 50’s. Kurtis Cars was a very big name. After that it became AJ Watson. Both of these guys had their shops in Glendale. When I was growing up in the 70’s, Frank’s shop was still on Colorado Boulevard and Frank’s son was building boats out of it. I was made very aware of the history that was around me. My grandfather was a dentist and he drove a 46 Lincoln Continental that was painted by George Barris. Back in the 50’s, it was very significant for my grandfather to have had Barris paint his car. My father was also a dentist. My dad was one of these guys that could name any old Ford on sight – year, make, and model. He had all the details. This was the household I grew up in. He taught me to weld when I was ten years old. I remember a spark from the weld I was doing lands on my motorcycle shirt and starts it on fire. I looked down and started to panic because I was on fire. My dad looks down very calmly and takes the shirt and puts it out. He said, “You need to be careful. You’ve got a lit torch in your hand. You can’t freak out just because you’re on fire. If you drop the torch, you’ll start a real fire. You’re on fire but you need to deal with it in a calm way.” Great, right? He was a wise man. [Laughs]. It became a teaching technique. He would tell me that if I got all B’s next semester, he would teach me to chrome the headers on my car. So I did it! By the time I was 16 the car was beautiful. I had a very privileged upbringing. The 70’s also held a great interest in the arts. We made stained glass windows together. Our house had four big beautiful windows in the basement so we put a piece of plywood over the pool table he had down there and it became the glass table. We’d never done it before but we decided we were going to learn how. I was supposed to be a dentist as well. But when I was at school at the University of Southern California I discovered hot glass in the art department. It completely captivated me. I ended up writing my senior business plans on opening glass studios. I became a glass blower and I did that for 20 years with hotrods and hotrodding as just a hobby. I played with hotrods but I made my living as an artist. I was part of the revival of a style of French paperweights from the 1800’s. 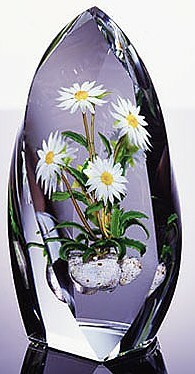 They are truly gorgeous, with delicate glass flowers blown inside them. I was part of bringing that style back in to popularity. And I was a successful artist for 20 years. People still collect my work. 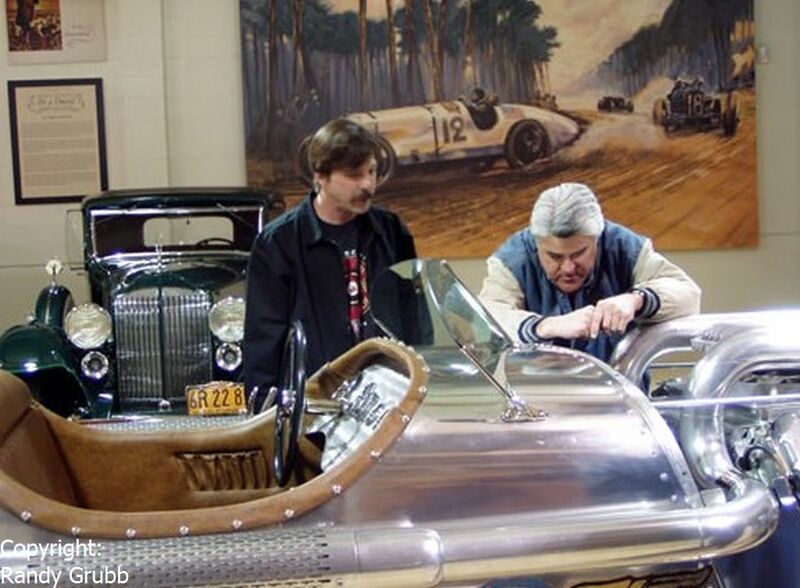 Then I decided I was going to build the Leno car and take a year off from building glass. And the rest is history. I never went back. 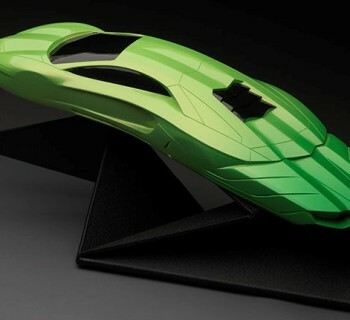 I made a good living as a paperweight artist but now I’m a car artist. My history of being exposed to cars and building cars and loving cars has now come full circle. I’ve been building cars for 40 years. My whole life I’ve been studying and looking at cars. If I’m going to take the time to build a car from scratch, it can’t have a block Chevy under the hood and it can’t look like an old Ford. I love them, but they are not the most beautiful cars built in the history of automobilia. Gorgeous cars are those of Delahey and Bugatti, not Ford. So this is what you mean by balanced sculpture. Exactly. My cars are caricatures of classic automobile genres. The 1930’s salt flat cars that the British brought over inspired Jay’s car. Their theory was big speed, big car. The cars became huge – up to 44 feet long and 16 feet wide. When you see photos of those cars, way of the back is an open cockpit with a glass windshield. I found those images very romantic and inspiring. These cars represent a period that we’re never going back to. Jay’s car is a tribute to this. It’s got a tank engine, it’s 22 feet long, and it’s got a 190-inch wheelbase. The next car, my Blastolene Indie Special, was my homage to AJ Watson and the beautiful indie cars he created in the 60’s. It has the Watson sharp nose, offset headrest, and fin tale. All I did was scale it up to fit this enormous tank motor. The Deluges and the Delahey’s of the 1930’s, the French curve cars, inspired the next. I noticed that you used your glasswork in the B702. Exactly. I try to incorporate glass into all of my sculptures. I’m very familiar with the material and I like it. Using a glass grill in the B702 was exceptional as were the glass taillights. The car after that was actually a truck. This was my take on the AA Alters that ran in the United States in the 60’s. They were short wheel base dragsters. They have 12-spoke spindle mounts on the front with big blown hemi motors. Those cars got wildly sideways and were very active at the track. They were very hard to control. The truck was my tribute to this genre. The piece after that was a DecoLiner. 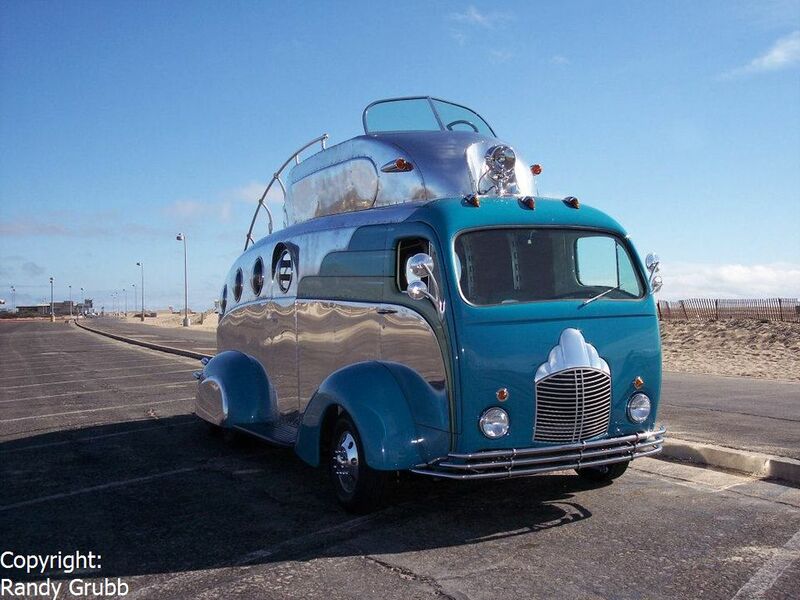 It was my take on what Flash Gordon’s motor homes might have looked like. He was getting older and wasn’t doing much interstellar work anymore. So I made him a little retirement home. The 1930’s Henderson Streamliners inspired the Decopods, the motorcycles with the doors on them. It was a one-off bike, very beautiful, with an aerodynamic body on it. On top of the very cool body are the handlebars. I think that they ruin the flow of the piece. The Decopod'ss were developed as just a crazy take on a motorcycle – putting doors on it and bringing the envelope up over the top of the handlebars. In the last decade I feel as though we’re almost. 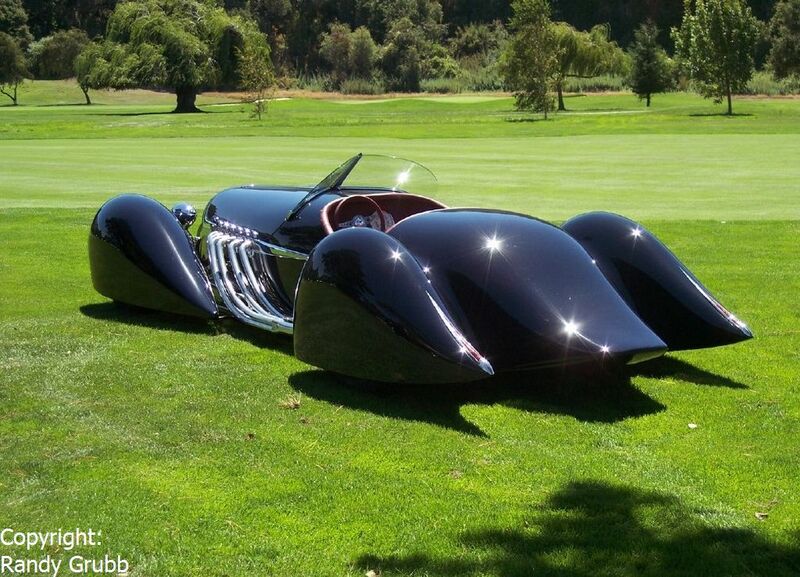 It won second place for Best Custom at the Quail Motorcycle gathering in Monterey. The Decopod won Most Innovative at the same event. So, that was great validation that I was on the right track. This was the first part of this interview. The second part will be posted in the coming days. Check Randy his website for photos and videos on all his work.